"It is Destiny that we have met in this place.. I wonder what fate you will choose." 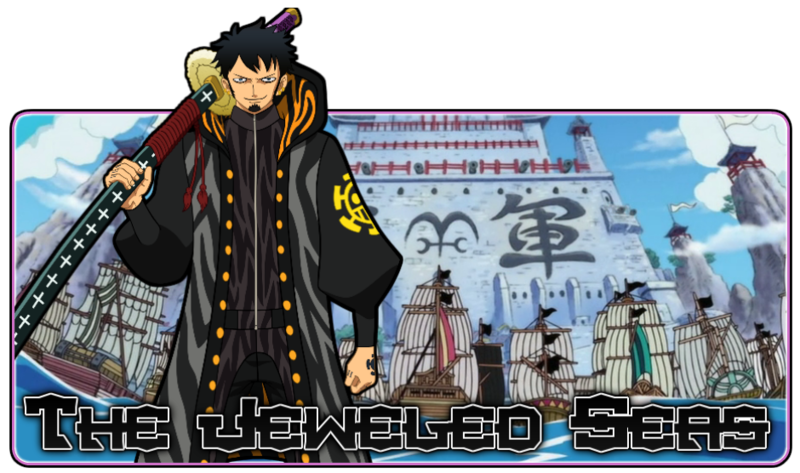 Jeweled Seas, The Free Non-Cannon One Piece forum directly shaped by the decisions of its members. - Here whatever you do becomes the RP's Reality; Become a blood thirsty Villain that cares nothing for the people, A treasure crazy Pirate! Will you become a Hero of the people? A Person of Virtue that travels the world to bring Justice to Villainy. A Guild Master? Someone Who Runs a custom guild and takes on each Job for great riches and wondrous Treasures. Or maybe you will become a Bounty Hunter, A Person who takes on Wanted men and woman for money. So Many Decisions to make.. So many things to transform and Do.. But the real Question is, Who Will you be? What Will you do to change this world? Have you had the Goal of taking over a small town? Or maybe an entire Kingdom? The unique System that rules the Forum makes it so what you do in this world directly effects it. If you take over a small village you can use it as a base of operations, However.. Whatever you do holds great consequences. If you happen to take a town for yourself then the World Government may just look into it. Not to mention the People that once lived there - They will probably send attack parties and get back the Town they once lived in. Be careful on what you decide and choose.. Become Part of the First Generation.. Join the BETA. - Earn More Beli, Bounty/Reputation and Gain Treasures Early on!